With the odds stacked against them, the GW Lady Geckos proved for the 7th straight time that the path to a champion goes through the purple and gold after beating the Cougars for the 2018 title. The FD Friars narrowly defeated the Sanchez Sharks in the regular season, but the championship proved a much different story as the Friars dominated the Sharks 26-7. 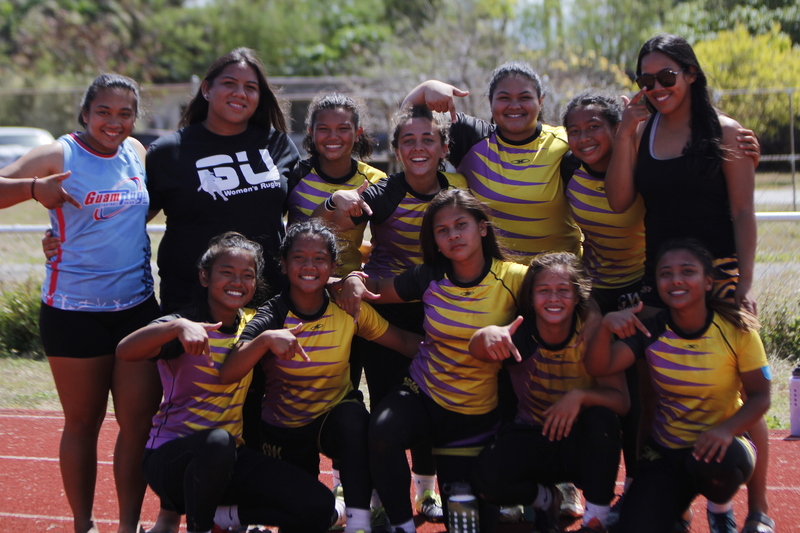 In the IIAAG Girl’s Varsity Rugby championship game at GW field, the George Washington Lady Geckos kept up their amazing streak by winning their seventh-straight (no typo) rugby championship! The Geckos, led by league MVP Jalana Garcia, defeated the Academy Cougars 15-10 to claim the title in comeback fashion! The Cougars made the Geckos work for it as they went up 10-0 early in the game. The Geckos stayed composed and scored 15 unanswered points to take the lead, and eventually the win. In the first half the Cougars got rolling early by connecting passes and moving the ball. Faith Moylan was able to capitalize off the great passing by finding an open lane to score the game’s first try and put the Cougars up 5-0. The Cougars marched right back down the field and Lavona Aromin was able to punch the ball in for an imposing 10-0 lead. With GW down 10-0 it looked like an upset was brewing, but the Geckos proved that you can never count them out, by driving down the field and and scoring a try to make it 10-5. Annaliah Quichocho scored her first try of the game to cut into the Academy lead just before halftime. The Lady Geckos came out in the 2nd half a lot more determined, with Garcia making a huge run along the sideline before dumping it to Quichocho for her second try of the game. The missed conversion kept the score tied at 10-10. Garcia, who led the league in points and tries scored, wasn’t quite done yet. As Academy was pushing the ball up the field, Garcia forced a turnover and recovered it herself, running in the ball for the game-winning try. Her heroic effort resulted in the 15-10 GW lead. The Cougars made multiple efforts to score but just couldn’t break through the Gecko defense in the second half. With the win the Geckos secured their seventh straight championship and continue the Lady Geckos rugby dynasty. The Father Duenas Friars are the 2018 IIAAG boys rugby champions for the third straight year! In a game they led from start-to-finish the Friars dominated the Sharks in a 26-7 win to claim their third straight rugby title. The Friars put up 19 points in the first half and never looked back, using their momentum to carry them to the victory. The Friars shared the wealth, with four different players recording tries and league MVP Matias Calvo making two conversions. “It really was a team effort today, the forwards and the backs worked hard on defense and offense today and we used that effort to get the win,” said Austin Peredo, who led the league in tries. Both teams came out swinging, with possession going back and forth before FD was able to break through. The Friars sent a long kick downfield that was recovered by Brian Anderson who ran the ball to about 10 yards out from the try line. The Friars moved the ball down the line to Auron Eclavea who was able to score the try and give FD the 5-0 lead. The Friars kept their foot on the gas, quickly making their way downfield again. Anderson had another big run and passed it off to Raven Santiago right before the try line to stretch the lead. Calvo made the conversion to put FD up 12-0. In just their next possession Calvo booted the ball downfield and Kai Aricayos was able to recover it. In a highlight run, Aricayos was able to shake off defenders and sprint it in for the try. After the conversion the score stood at 19-0. The Friar defense matched the offensive outburst as they came up with big stops to keep Sanchez scoreless at the half. The Sharks came out in the second half a lot more aggressive but could not break through the FD defensive line. The Friars offense, meanwhile could not be stopped as they advanced up the field and scored again. This time it was Peredo who scored off a line-out play, barreling it in for the try. Joseph Green iced the game with a conversion putting FD up 26-0. The Sharks’ Brandon Reyes scored a late try and after the conversion the final score stood at 26-7. The score didn’t dampen the Friar’s celebration as they stormed the field for their big win.